Southend-on-Sea. The name says it all really. Tourists visiting the coast over the summer months to swim in the sea are vital for Southend’s economy and new European standards coming in this year mean that passing water quality tests will be more difficult than in previous years. One source of pollution at Southend Jubilee beach is down to household drains that are not correctly connected. By simply checking your connections you could help improve water quality at your local beach. Misconnected drains can have a big impact on our beaches. Wrongly connected drains, or misconnected plumbing, takes dirty water and sewage from our homes and discharges it straight to local rivers and beaches. Would you be surprised to hear that an estimated 1 in 5 homes have misconnected drains? 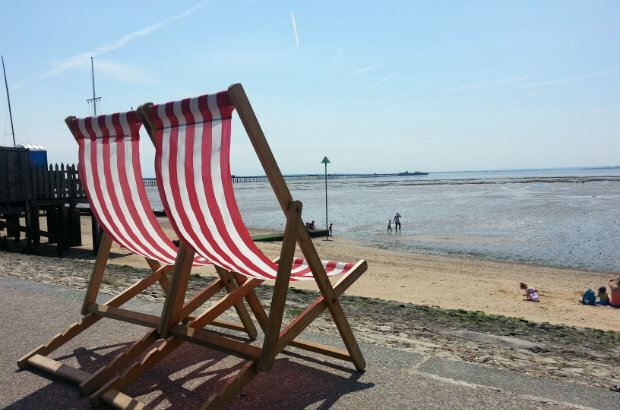 Work by the Environment Agency at Southend Jubilee, a beach situated at the heart of the town’s seafront, has shown misconnected drains are having an impact on bathing water quality. This beach is not alone – misconnections pollute 9% of bathing waters and 15% of rivers. While last year was a record-breaking year for English beaches, with 99.5% passing the standard, new European standards are coming in this year and they will be twice as tough to pass. We've been working with Anglian Water and Southend Borough Council to improve water quality and rise to the challenge of meeting the new standard by the end of 2015. There are two large surface water outfalls that discharge into the water at Southend Jubilee – both of which have been the subject of in-depth investigations as potential sources of pollution. During 2013-14, more than 130 misconnections were identified and rectified across the Southend area, leading to improved bathing water quality. Ninety of these misconnections were feeding into the two outfalls – and one block of flats had up to half of its waste water plumbed into surface water sewers. The average domestic property in the UK is estimated to produce 150 litres of waste water per person per day and homes in the south-east have higher than average water usage than the rest of England. Fixing the misconnections at these flats meant at least 3,000 litres of untreated waste water each day was stopped from flowing straight into the sea. The Environment Agency is working with water companies to find and resolve misconnections, but we are also developing ways to work better with local authorities to try to find, resolve and ultimately stop misconnections occurring in the first instance. You can help improve local water quality by checking your own connections and ensuring you use an accredited plumber. The ConnectRight website provides all the advice and guidance you need, such as help if you are planning a DIY job or building project, and also allows you to search for to a local accredited Watersafe plumber. The great news is that improvements have been made at all beaches across Southend. Last year, under the old directive, Jubilee met the higher standard for water quality for the first time since 2010. This year it has won a Seaside Award from Keep Britain Tidy. There is a lot more work to do, but there is confidence that the partnerships between organisations can help deliver these water quality improvements so the sea at Southend achieves a good standard and is kept free of pollution.